As the Lake District is one of my favourite places in the UK, I was keen to try out Bigland Hall near Ulverston, which had previously been located nearer the coast. Although the countryside is not as spectacular as the northerly part of the Lake District it does have the advantage of fewer tourists and quieter roads. I only had time for a two hour ride so inevitably there was some road work to get to local bridleways. After an assessment in the indoor school (always as nerve wracking experience!) Steven and I went out. I rode Indie - who was very willing. We had lovely views of the hills and had a few short canters in the fields. The time passed very quickly as Steven is very entertaining. 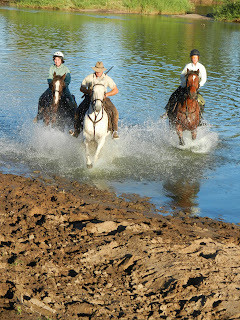 I would love to try the 2-5 day trail rides next and go father afield in this lovely area.